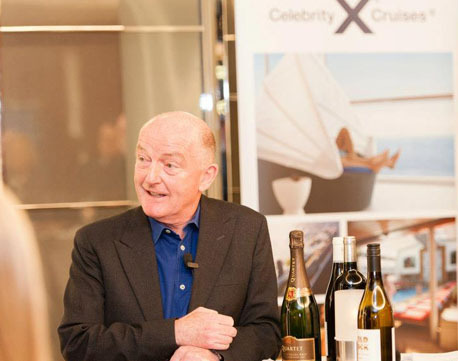 Wine expert Oz Clarke had so much fun on his first cruise last year that he’s coming back for more. He will be hosting a themed cruise in October which takes in Bordeaux in France, the Rioja region of Spain, and the home of port in Portugal. Once hailed as Britain’s youngest-ever Wine Taster of the Year, his enthusiasm, his encyclopaedic knowledge, and his gift for entertainment remain undimmed 40 years later, as he demonstrated with a virtuoso performance in London this week for guests of Celebrity Cruises. Taking us through a collection of wines he had selected from the list of those available on board Celebrity’s ships, he pretty near transported his audience to the vineyards of California, New Zealand and France without actually leaving the Bvlgari Hotel. “This time last year, I had never cruised before but, following my first stint as host of the immersive European wine cruises, where I was able to share my knowledge and talk to fine food and wine fans, I can honestly say I’m now hooked,” he said. Oz will be sailing on Celebrity Infinity for a 12-night cruise which leaves Harwich on October 12 and visits Le Havre, Le Verdon (for Bordeaux), La Rochelle, Bilbao, Vigo, and Leixoes (for Porto). Passengers will enjoy exclusive wine masterclasses with Oz and learn about the range of wine styles and grape varieties in the regions visited. They will also take part in Champagne brunches, Bordeaux samplings, lessons in how to pair wine and food, and a range of dedicated shore excursions visiting renowned chateaux and vineyards. Ahead of the Oz Clarke hosted sailing, Celebrity Cruises will also offer three wine-themed cruises to popular vineyard destinations throughout Europe, departing from Harwich on September 6, 18 and 30. ►On dry land, Oz Clarke appears with the Three Wine Men at food and wine fairs throughout the country. Fellow expert Olly Smith (the third member of the trio is journalist Tim Atkin) has his own wine bar, The Glass House on board P&O’s Azura. It is soon to be joined by a second venue which will be installed on sister ship Ventura during a refit at the beginning of April. Olly, a regular guest on TV’s Saturday Kitchen, will be travelling on three forthcoming Azura cruises, hosting tastings of the wines he has chosen for the ship. He will be joined by Michelin-starred chef Atul Kochhar and master patissier Eric Lanlard on a 14-night Mediterranean cruise leaving Southampton on April 27; joins the ship again during a 24-night voyage to the Eastern Mediterranean sailing on September 7, and will be back on board for a 14-night Caribbean cruise in February 2014.